We have a date for our next round of performances of Mrs. Hawking shows! Our newest shows, Gilded Cages and Mrs. Frost, will be going up at the Watch City Steampunk Festival 2019 in Waltham, Massachusetts! 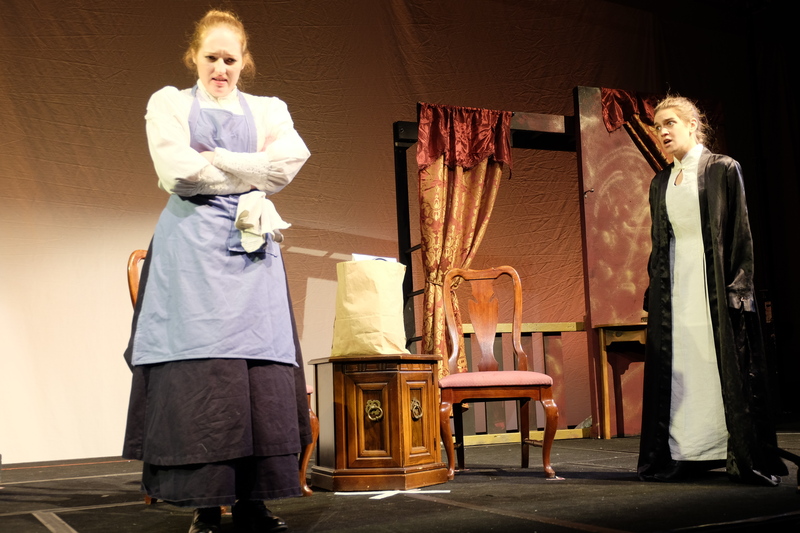 The latest installments of the Hawking series are returning with a stellar cast and crew to Waltham’s free spring steampunk festival with two free shows! London, 1884—For 25 years, Mrs. Hawking has battled injustice as the Lady’s Champion of London. But it has been a difficult path that led her to her life’s work as a superhero, and finally the truth behind Mrs. H’s discovery of her calling will be revealed. As she takes on a case against an enemy beyond any she’s ever faced, the struggles and mistakes of her past have come back to haunt her. CN: parental abuse, mention of stillbirth. London, 1886— The reveal of Mrs. Hawking’s greatest enemy yet has left our hero brooding over past failures, so consumed in destroying the criminal mastermind that even apprentices Mary and Nathaniel feel frozen out of her life. But when Nathaniel is taken captive, and an important figure from her past returns, Mrs. Hawking must work with some remarkable women to defeat her nemesis once and for all. CN: mention of sexual assault, Victorian mental health practices. 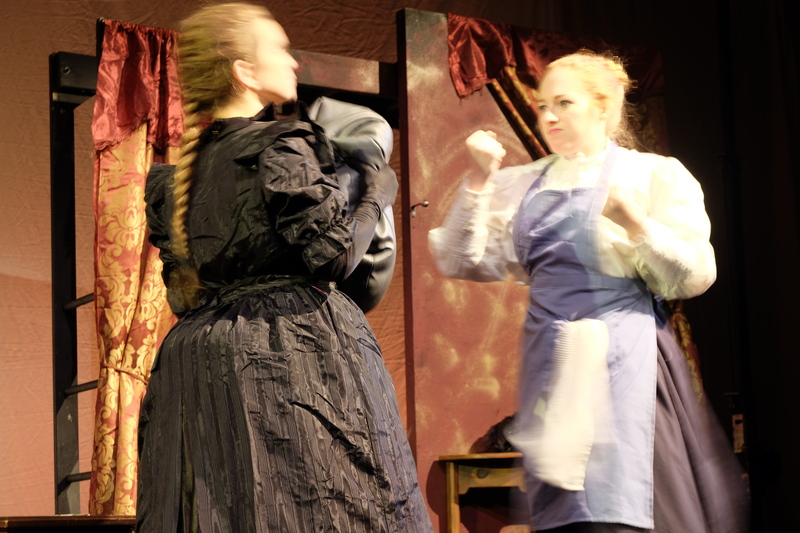 Our shows run ninety minutes without intermission, and admission is free. 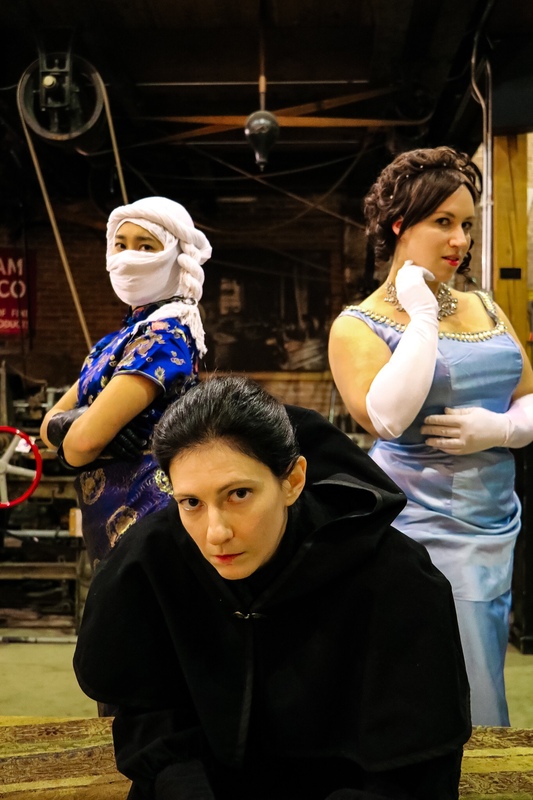 If you missed us at Arisia 2019, be certain to mark your calendars to join us for this open festival performance, produced by Breaking Light Productions and brought to you by the Waltham Watch City Steampunk Festival! “Gilded Cages” and “Mrs. Frost” by Phoebe Roberts and Bernie Gabin will be performed on Saturday, May 11th at 2pm and 6pm respectively at the First Parish Church at 50 Church Street, Waltham, MA as part of the Watch City Steampunk Festival. Gilded Cages and Mrs. Frost scheduled at Arisia 2019! Trailer for debut of MRS. FROST at Arisia 2019! 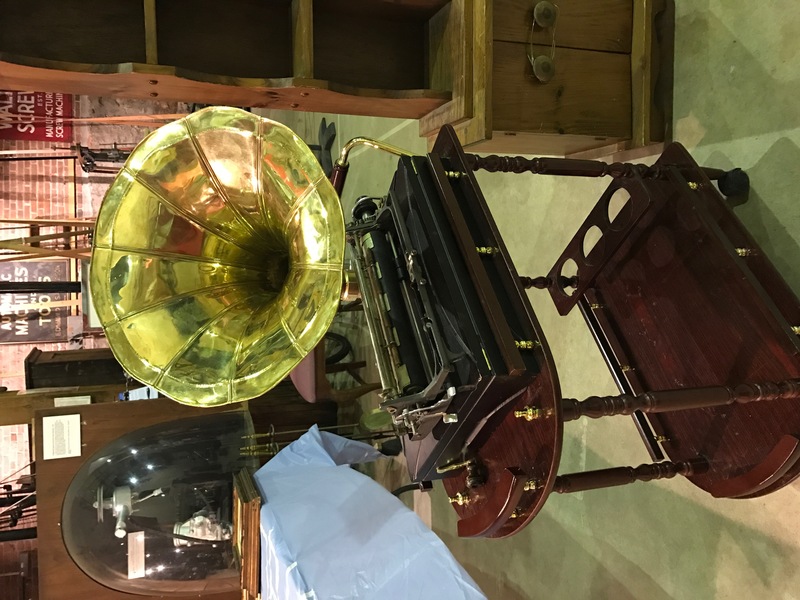 You may recall that when we were putting together Base Instruments for the first run at Arisia 2017, the challenge arose for us to somehow get the victrola prop that is a major presence in the story. 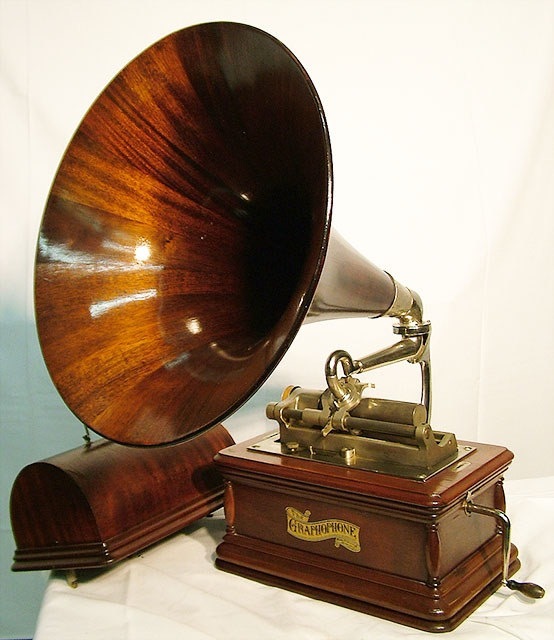 While there are a number of record players on eBay and similar places that use the pressed vinyl disc, at this point in history the phonograph relied upon wax cylinders. It’s significantly harder to find even replicas of that older form of the technology. So we decided we would make one, and we’ll be bringing it to our performances at the 2017 Watch City Steampunk Festival. When last I posted about this, I had a plan for it, but I wasn’t sure if it was going to work. 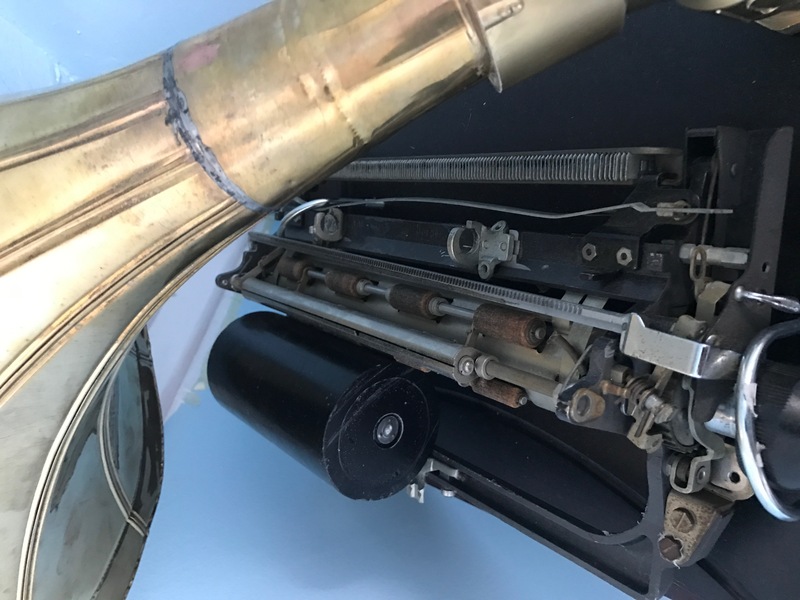 I got a hold of all the pieces I thought could be put together for the final product— a clock crank, a brass horn, a sturdy wooden box, and the assembly from the top of a typewriter to stand in for the mechanism of the player. But it took assistance from Bernie, our technical director and the man with the knowhow to realize all these stories’ ridiculous stage needs, to actually build it. First he drilled a hole in the side of the box to put the crank through, affixing it with a nut on the inside so it could spin. More holes were drilled in the lid so that the typewriter assembly could be attached with U-shaped bolts. He made a large hole, this time with a paddle bit, in the lid and got some interlocking pieces of PVC, which we sprayed gold to match the color of the brass horn. He attached half of it to the box and the other half to the horn, then screwed them together so hold it up as the speaker. The final touch was provided by cast member Brian Rust, who brought us a fat black candle to serve as the wax cylinder. The candle’s scent, incidentally, was listed as “black cat,” which makes me particularly glad we needed it to stand in for a piece of our old timey not-record-player rather than burning it. I was very happy with how it came out. It’s quite heavy, but fortunately it doesn’t need to move around much. It has exactly the right look I was hoping for, old-fashioned and attractive but a little bit industrial— perfect to add more design flavor to a fully-realized steampunk show. Vivat Regina and Base Instruments by Phoebe Roberts will be performed at 2PM and 6PM respectively at 274 Moody Street in Waltham, MA as part of the Watch City Steampunk Festival 2017. Want to catch our shows at Arisia 2016, but the cost of membership is a little too high for you? Well, here’s your chance to win two full weekend memberships for FREE in Mrs. Hawking’s Arisia membership raffle! For the next two weeks, we are raffling off not one but TWO passes to the Arisia 2017 convention! This will give you complete access to all hours and events of the con in the Westin Waterfront Boston hotel January 13th through 16th. Entries will close on Wednesday, December 21st at 12AM. A winner will be drawn at random and announced at 12PM on the 21st. The selected person will provide us with their contact information so that we can transfer the Arisia memberships into whatever names they choose. We shall be pleased to have you as our guests at our performances! 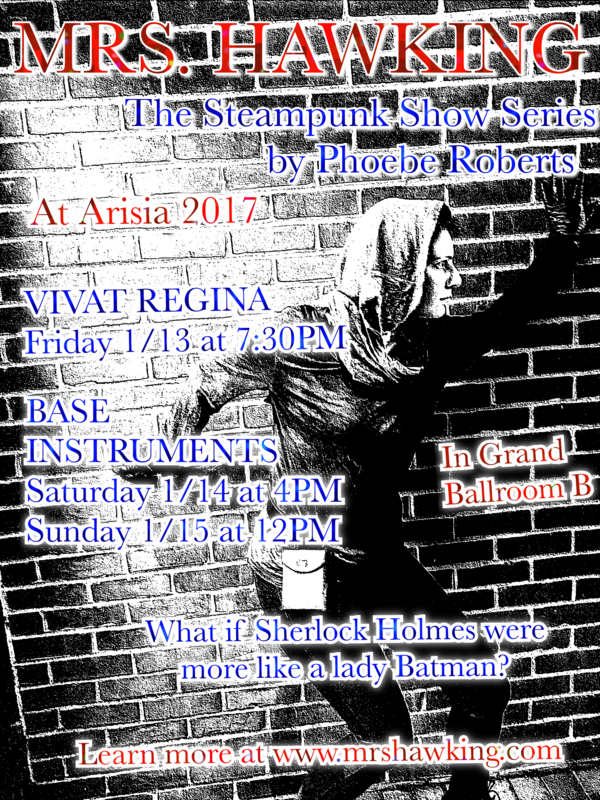 Vivat Regina and Base Instruments by Phoebe Roberts will be performed January 13th-15th at the Boston Westin Waterfront Hotel as part of Arisia 2017. Winner of the Arisia 2017 membership raffle! Show times at Arisia 2017! We are officially on the schedule at Arisia 2017! Please come join as at Arisia 2017 this January and come see our shows, including the debut performance of Base Instruments! 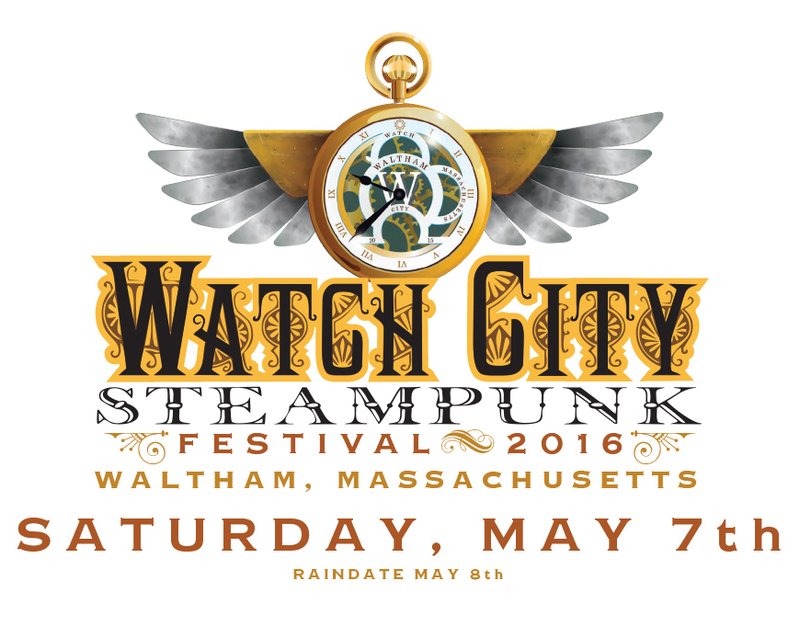 On the schedule at the Watch City Steampunk Festival ’16! Our shows are on the schedule of events happening at the Watch City Steampunk Festival 2016! But we’re not the only great events happening that day. The festival will be full of entertainment, including live music, art displays, vendors, and food. Rumor has it the kraken that lives in the Charles River will rise up for a grudge match against a clockwork robot! Be sure to check out the schedule not only for the information for Mrs. Hawking and Vivat Regina, but also for all the other great events happening that day at this totally free family event. Our shows are quick, free, and fun– only one hour each with no ticket price! –so be sure to make a day out of it. Come for the shows, stay for the rest of the festival! 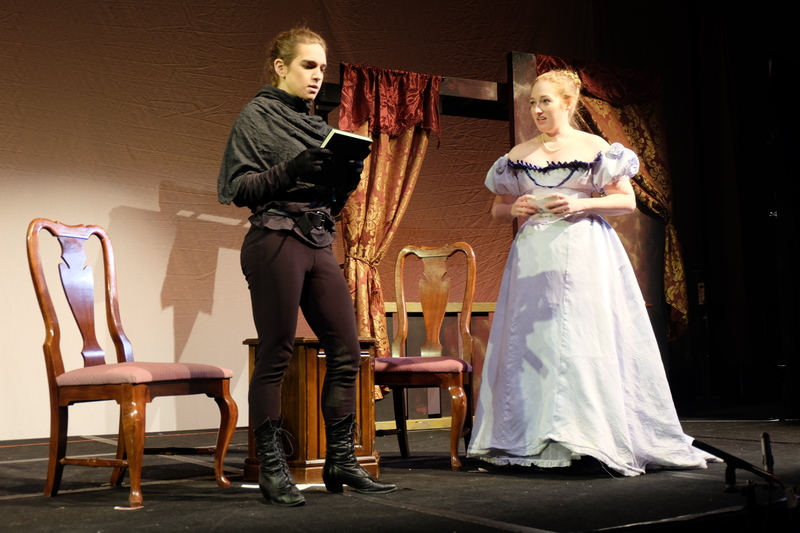 Mrs. Hawking and Vivat Regina will be performed on May 7th at 119 School Street, Waltham, MA at 2PM and 6PM as part of the Watch City Steampunk Festival 2016 in Waltham, MA. Despite the fact that the series is named after Mrs. Hawking, in many ways this is really the story of Mary. It’s about her growing into a true hero, and in saving others finding the way to save herself. 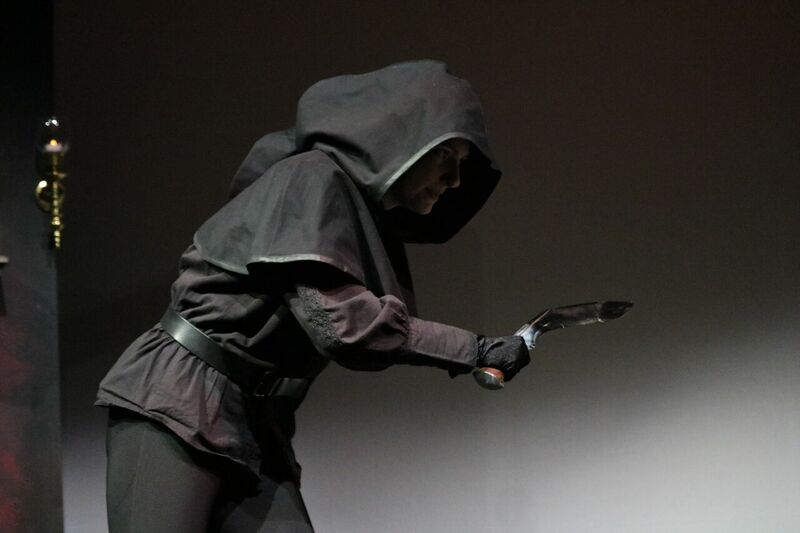 Played by Circe Rowan, Mary’s journey comes from the fact that her world used to be very small. As a servant and a member of the lower classes, everything about her life encouraged her to never use her own mind, to never speak her own thoughts, that she was of most use to others doing what she was told. She has seen very little of life, and has never been encouraged to see herself as a person with skills and strength to give. In being Mrs. Hawking’s assistant, she must learn many new skills— how to fight, to move with stealth, to operate without detection, to take on personas, to come up with plans of attack. The level of excellence required to pull off something so difficult as saving people from the traps of society is enormous, and when we enter Vivat Regina, Mary is struggling to meet the high expectations. And with her mentor’s constant pushing, she’s begun to doubt whether or not she has it in her to meet it all. But it’s not enough to just learn what Mrs. Hawking has to teach. Mary has to learn her own strength, her own way of doing things. And part of this is developing the confidence in herself, both her abilities and her own judgment, to push herself to do what she has to do. And sometimes that’s going to mean speaking out, disagreeing, making her own path. It’s no small task for a former servant girl who was supposed to make herself invisible at all times. But Mary is an exceptional person, and watching her grow into her potential shapes a huge portion of this story.